District 1 Senator Sharon Hewitt came to the Louisiana State Senate as a recognized business and community leader with decades of volunteer service to area children and families. The Lake Charles native and long-time resident of Slidell is a graduate of Barbe High School and holds a bachelor of science in mechanical engineering from LSU. As an engineering executive, Senator Hewitt managed major deepwater assets in the Gulf of Mexico for Shell and earned a reputation as a passionate, committed problem solver. As a state senator, Hewitt serves as vice-chair of the Senate Transportation Committee, and is a member of the Senate Environmental Committee, the Joint Budget Committee, and the Senate Finance Committee, which oversees the state budgeting process. 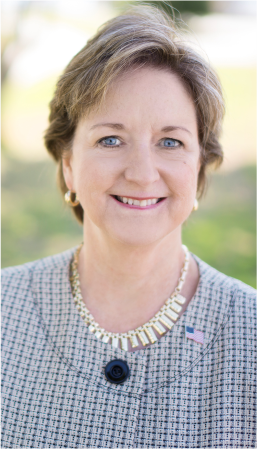 In addition, the Senator represents the state of Louisiana on two important national energy panels, serves on several statewide coastal restoration committees, and is Vice-Chair of the Women’s Caucus. Since beginning her first term in 2016, the Senator has focused on fiscal reforms to shrink the size of government, to limit spending, to tie state funding to results, and to streamline higher education and healthcare. In addition, Senator Hewitt is the leading advocate for growing the Louisiana economy by creating a STEM workforce, enabling families to realize the American dream and women to close the gender gap. Senator Hewitt married her husband, Stan, over 35 years ago and they have proudly raised two sons, Chris and Brad. They are longtime members of Aldersgate United Methodist Church in Slidell. Senate District 1 includes portions of St. Tammany, St. Bernard, Plaquemines, and Orleans parishes.